Priced: $81.22 - $145.00 Rated: - 5 stars out of 5 by 30 reviews. Salomon created the SpeedCross 3 Trail Running Shoe for women who can't stand to run on the pavement when they race on foot. Comprised of lightweight uppers and a flexible midsole and outsole, this shoe offers ample protection from hazards on the trail and an aggressive design that helps you move fast. Slide your foot inside and you'll immediately fall in love with the contoured and supportive fit, and just a single pull of the QuickLace tab tightens the laces and locks your foot in place. Running on the trail means that you're bound to encounter some sloppiness, so Salomon gave this shoe water-resistant textile, a mud guard, and large, traction-happy lugs. Salomon divides its running shoes into a number of different collections: the XS for speed in all conditions, the XR for performance training, and the XT for all-terrain running. This shoe, the SpeedCross 3, belongs to the XS collection, which makes it ideal for blazing through tough terrain from late spring to early fall. Runners who want even more weather protection than this shoe offers might prefer the Speedcross 3 CS, which comes with a waterproof breathable membrane in the forefoot to keep your foot dry when you're faced with rain, mud, and the like. Get into the groove with the Salomon Speedcross 3 for women. This is the update to the iconic, light weight, aggressive profile, Salomon Speedcross trail racing shoe. The women's version is designed specifically for females. Excellent grip on bottom keep you in control. Standard Salomon Two Year Warranty. The Salomon Speedcross 3 trail running shoe is a no-joke runner for those who really want it all. FEATURES of the Salomon Women's Speedcross 3 CS Shoe. SPECIFICATIONS of the Salomon Women's Speedcross 3 CS Shoe. Put yourself ahead of the pack with the Salomon Speedcross 3 CS shoe. This women's cold-weather racing shoe features a breathable, anti-debris mesh upper with water-resistant synthetic overlays for support. The Contagrip outsole tackles challenging terrain with confidence in the Salomon Speedcross 3 CS multisport shoe. The Salomon Speedcross 3 CS is a winter racing shoe with innovative Climashield design and aggressive tread for comfort and grip on wet, sloppy trail conditions. Lightweight upper with anti-debris mesh and strategically placed water resistant textile parts in order to keep away the unwanted debris. Sensifit™ technology ensures an enhanced, snug fit. Quicklace system allows for a secure, customized fit. Lace pockets keeps laces tucked away. Protective rubber toe cap. Soft, synthetic linings for a great step-in feel. OrthoLite® insole offers underfoot comfort and features moisture-managing properties for a cooler, drier environment. SCS cushioning system located at the heel and under the metatarsal region is designed for improved cushioning and energy return. Dual-density EVA midsole adds supreme cushioning. Mud & Snow Contagrip non-marking rubber outsole, is especially designed to provide exceptional grip and durability in winter conditions. Aggressive lug pattern gives optimal traction. Wt. 9.9 oz. ™ technology ensures an enhanced, snug fit. ™ system allows for a secure, customized fit. s keeps laces tucked away. surrounds the base supplying extra durability. ® insole offers underfoot comfort and features moisture-managing properties for a cooler, drier environment. The iconic Salomon Speedcross 3 Women’s running shoe delivers lightweight support and traction for trail racing and mountain running. A heavily lugged outsole and ultra-durable construction equip the shoe for demanding terrain. Salomon Speedcross 3 CS - Women's: Update to the iconic, light weight, aggressive profile, trail racing shoe. Salomon's Speedcross 3 CS Trail Running Shoe belongs on muddy singletracks and wintery trails covered with snow and slush. The Salomon Speedcross 3 Trail Running Shoes - are an updated version of the iconic, light weight, agressive profile, trail racing shoe. This shoe weighs in at a low 9.91 oz (7US). Push your limits in the Salomon Speedcross 3 trail-running shoes, built for trail races and fast-paced training. Salomon’s iconic running shoe that brought speed to the trails! Featuring a Climashield™ protective upper, aggressive tread, and a precise fit, you’ll feel confident ripping through the sloppiest of trails in any weather conditions. This are the running shoes for me! Prior to their release, I swore by the XT Wing Goretex, but the low volume fit of the Speedcross was a revelation for my feet in running. I'm breaking in my second pair, and going into my second season of running exclusively in these shoes and have yet to get a blister. Last year, I focused on training for my first long(er) distance/ vertical gain trail race (17 miles, 4,000 ft elevation gain). My training never suffered due to sore, chaffed, or bloody feet. I didn't even loose a toenail, which is a first for me in running shoes. They are also incredible lightweight, and the tread is bomber, whether you are on loose, dry slopes or running through sloppy mud. The quick lace system is still one of my favorites, I've never had to worry about tripping over an untied lace. I would also give these shoes a gold star for durability, after the first season my original pair are still holding up well, with no visible signs of break down to the sole or to the canvas. I only bought a new pair because the green/pink combo was calling my name! I love these shoes!!! The Salomon Speedcross 3 trail running shoes make your feet feel like they are walking/hiking/running on clouds!! I have high arches and these shoes provide enough support. I have been wearing them all winter hiking and running trails; have run a couple 12 mile trail runs in them. The first race did leave a blister on my big toe (from rubbing on the side of my toe) BUT it poured down rain for a majority of that race and these shoes are not waterproof. Last 12 mile race--no problems!! I have worn these on the road (probably not the best thing for these shoes) and love running in them. I am a nurse and have worn these shoes for a 12 hour shift; my feet and body feel great after 12 hours in these shoes!! In terms of size, I usually wear 7 1/2 in road running shoes, but am comfortable in size 7 with these even with thick winter socks. Also, love the lacing system. I pretty much wear these shoes every day b/c they are so darn comfortable!!!! I finally found a trail shoe! I usually use Mizuno wave runners (they have been my standard), a road running shoe, but since at least 1/4 of my running is terrain, I've been looking for a comparable trail shoe for over a year now. These are it- Comfortwise, the insole is comparable to my Mizuno's. Running wise, they are slightly heavier, the sole is stiffer (not a bad thing here) and I love the traction. They say that are water resistant- think cutting through a field with light dew, but nothing more. Thus far I've really enjoyed them (I've only had them for 2mo). There have already been many times when I think "if I had my other shoes on right now I'd have to slow down or I'd be falling down". With these I've been able to charge up and down snowy and muddy slopes without worrying my feet will go out from under me, and most importantly they don't hurt my feet!!! I've had these shoes for over a year, and I love them. I bought them for hiking in the Wasatch range, and have put a lot of miles into them. No complaints whatsoever. They're light, grippy, comfortable, and durable. They were comfortable from day 1 and are equally as comfortable now. I was worried the wimpy looking laces might break, but they haven't. My only caution would be to not make them your street shoes... the tread on the bottom is really soft and grippy, so pavement strips them pretty quickly. That said, I'll definitely be buying another pair. I normally size up to a 9.5 for running shoes, but I bought these in a 9 (my street shoe size) and they fit. These are the only shoes I wear now for everyday walking around. Thank goodness I found them! I have had Salomon running shoes in the past and I liked them well enough, but I tried a couple of different brands over the last couple of years. I am a trail runner only...never on the roads. The Salomon SpeedCross 3 Trail is the only shoe I will wear! I run trails that are super narrow, steep and rocky and these shoes make it happen! My last pair were Asics Trail and I ended up with my first shin splints EVER and I have been running for 20 years. The stability, traction and overall comfort make me want to buy another pair to put away in case they change! Absolutely love them!! I bought these because I do a lot of mud runs and I quickly discovered that my normal running shoes were not for such runs. I love these shoes and can't say enough good things about them. I just did the Tough Mudder this past weekend and these shoes worked great. If you are doing any obstacle course or off trail running I would highly recommend these shoes because they are worth every penny. They do run big. I typically wear a size 9. However, I wear a 9.5 in most all running shoes. In the SpeedCross 3, I wear a 8.5 and they fit perfect. When it comes to shoes I am the most challenging to please. I have had 7 foot surgeries and suffer from a lot of nerve damage. With the help of these shoes I am climbing mountains again! I can go anywhere in them. It doesnt matter if im at work, walking down the street, going to the mall or climbing my local trail I wear these shoes. I am constanly asked by people what brand they are because they really stand out being so brightly colored! And when my 7 month old puppy accidently chewed the laces off REI was quick to find me replacement laces! I love my speedcross3 shoes! I use them from anything from trail running, to hiking with a heavy pack. They work great for most all conditions. I have used these on hikes where there was snow, mud and rocks and I felt confident in all conditions. I have a wide foot, so I was hesitant at first but I ordered a .5 size up and they fit very well. The speedcross 3 shoes, never gave me blisters, even right out of the box! Always a bonus. Hurray! The best trail shoes I've ever had!! I run through mud, over roots, fields and swamps with these shoes. They fit like a glove. Stay dry and clean up easy. I especially love the tread on this shoe. Only negative is the lacing system tends to loosen if you don't really ratchet it tight, plus I have a lot of extra lace that I have to secure so it's not flopping around. But this did not prevent me from buying a second pair. Highly recommend! 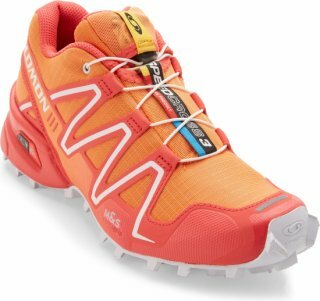 I ordered these shoes because I really like the bright colors, and I was looking for a lightweight trail shoe for hiking and running. I frequently hike on very rocky, steep trails, so I wanted something light but still sturdy, and these sounded like they would work well. When they arrived, I knew that they were way too big-- I had ordered a size 6 (the smallest size available on this website) and it felt 1/2 size too big. I usually wear a 6 1/2 in ordinary shoes, but my size in hiking footwear is really hard to pin down-- my backpacking boots are 5 1/2, but my old Vasque trail running shoes (slightly too large) are size 7! Anyway, I think these run a FULL size too large. Also, I tried them briefly and thought they might be a bit too light and soft on the sole for the very rocky hiking I often do. So they had to go back and I found a slightly tougher Salomon shoe (the Ellipse Aero) in size 5 1/2 elsewhere-- and that size fits well. I bought these shoes because I am often running on wet grass and wanted a shoe that would keep my feet dry. I looked hard to find something to replace some shoes that truly kept my feet dry but that had finally worn out. I did not like the shape of these shoes but they were the only shoes I could find that claim to have waterproof uppers. However, they DO NOT keep my feet dry.